Kevin Gascoyne, François Marchand, Jasmin Desharnais and Hugo Américi are professional tea tasters and the owners of Camellia Sinensis Tea House in Montreal, Quebec. No, that's not quite right. 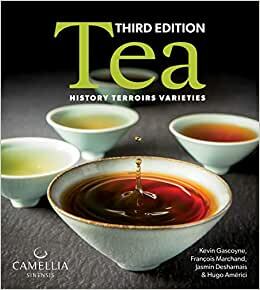 I bought this book because I've been drinking gallons of tea every week for years without a real appreciation for its history, cultivation or production. I'd tried quite a wide variety of teas, all loose leaf of course, without taking any tasting notes, and while I had a vague idea of what I preferred and the differences between different varieties of teas I certainly couldn't talk at length about things like the degree of oxidization oolongs are subjected to. Instead of picking up knowledge bit by bit I wanted to really sit down and learn about it. This book takes you on quite a tour -- through the history of tea along with detailed sections on China, Japan, Taiwan & India and shorter sections on other tea-producing regions, following up with a guide to preparation and some recipes. It's also a beautiful book, peppered with gorgeous pictures of every step of tea production and interviews, and well worth the money. 82 people found this helpful. So here's the thing. I'm starting a research project on tea, and as a newbie, just want to be eased into the basics. What is a green? What is a black? How do you go about tasting a tea, what do you look for in buying a tea? I also appreciate history told in a narrative, vs. an encyclopedic, fashion. This book is about as readable as an encyclopedia – that is to say, not at all. It's not narrative based; rather, it has chunks of facts such as pages listing otherwise obscure varietals of Japanese greens. On the contrary, it's very good, I imagine, if you're trying to look something up; a specific question, a specific type of tea – hence the description of it as encyclopedic. Lastly, the pictures are great, but the book could be more design-forward in its layout. There are several typographic errors as well (omissions of spaces, etc. ), which are distracting. I would not repurchase. This review was originally written for 27Press.com.